Think you’ll never be involved in a forklift accident? You might want to think again. Despite the best training methods, OSHA regulations, safety hazard warnings, and other measures designed to increase workplace safety, accidents happen all the time. Definitely more often than we think they should happen. Accidents happen every day on worksites across the U.S., and they often involve heavy pieces of equipment like forklifts. According to OSHA, there were 4, 836 worker fatalities in 2015, which equals about 13 deaths per day. In 2017, powered industrial truck infractions were once again in the top 10. OSHA reported almost 2,500 violations of standard 1910.178, which covers all safety rules and training requirements for forklifts and other industrial equipment. While accidents do happen at work, serious injuries and fatalities can be prevented. It’s important to have a plan in place for responding to accidents. Knowing what to do when an accident happens at work is a critical skill – and one that can actually save lives. The type of workplace you’re in has a lot to do with how severe and life-threatening those accidents can be. For office workers, the term “accident” may only mean a slip on a wet cafeteria floor. But for forklift drivers, pallet jack operators, and other industrial powered truck employees, accidents can be very serious indeed. 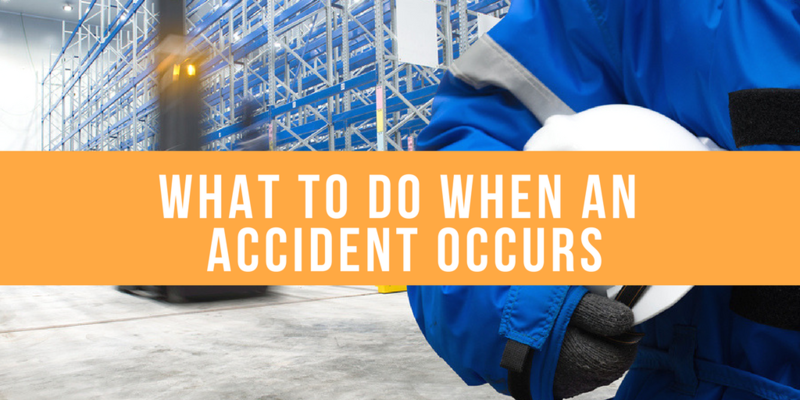 Do you know what to do when an accident happens at work? Let’s review some important safety guidelines, along with some practical advice for responding to accidents in the most efficient manner possible. The Occupational Safety and Health Act was created to give all workers a safe workplace and reduce the number of annual injuries and fatalities. According to the act, all employers must provide employees with a safe work environment and protect them from hazards. They must also properly examine a workplace for safety, provide employees with tools and safety training in a language they can understand, and more. For a full list of employer responsibilities, go here. For employee rights, review the “Know Your Rights” section on this page. To further help create a safe workplace, OSHA suggests companies invest in a safety and health program. Investing in a top quality and cost-efficient forklift training program for employees can protect your business, your workers, and prevent costly fines. Even with these rights and responsibilities of employees and employers, accidents still happen and it’s important to understand how to respond. OSHA rules and guidelines are created to help supervisors and regular employees know what to do when an accident happens at work. It’s up to employers and safety-minded employees – which should be all employees – to keep up-to-date with the latest OSHA standards. With CertifyMe.net, you’re ensured that you’ll have the latest OSHA-approved training – because we keep current for you! Get medical attention: If you’re an employee, find a supervisor, get medical assistance, or call 911. This is the first and most important part of what to do when an accident happens at work. Quick and efficient medical response can mean the difference between life and death. If your company has a safety site supervisor or medical response team, alert them as soon as possible, along with external medical assistance with a 911 call. Report the accident: Employers should speak with witnesses of the accident to get their accounts, take photos where the accident took place, and comply with all OSHA reporting and recordkeeping regulations. This is important in thinking about what to do when an accident happens at work: always be truthful in the post-accident report. If OSHA realizes that the initial accident report has any holes or half-truths, they will impose significant fines and penalties. Once proper medical attention and accident reporting has happened, there’s another thing you should do when an accident happens at work. Take the proper measures to ensure a similar accident never happens again. This is done through a detailed accident review and investigation. CertifyMe.net has a Train the Trainer course that puts OSHA expertise right in your workplace. With this resource in-house, you’ll be able to determine not only how and why the accident happened, but which preventative actions can avoid accidents down the road. For example, if your company’s forklift accident involved a turn through a warehouse blind spot that wasn’t previously known, you can install mirrors and warning signs to alert forklift drivers. For a complete list of all reporting policies, click here. File workers’ compensation reports, if applicable in your state. Determine the liability: As the employer, you may need to cover medical expenses and disability leave for the employees affected by the accident. If the accident was a result of an OSHA violation, the employer may also have to pay for additional compensation and employee benefits. If you have any other questions about what to do when an accident happens at work, visit the OSHA website, or call the OSHA office nearest you. CertifyMe.net has the training, skills, and knowledge to help everyone know what to do when an accident happens at work. Knowing how to respond to an accident is important – but so is avoiding accidents and injuries in the first place. That’s the idea behind our forklift training and certification. Our courses will give the safety training you need to enjoy a productive, safety-first workplace. To learn more about our safety training, and to make sure you know what steps to take when an accident happens at work, call CertifyMe.net at 1-888-699-4800. Our OSHA safety consultants are here to help you become the best you can be. See why superior safety training makes all the difference – get started with CertifyMe.net today! Whether you work in a warehouse, dock, lumber yard or other distribution center, the proper storage and management of cargo and related containers is important for overall safety. OSHA guidelines contain plenty of rules and regulations surrounding cargo containers – and if your workplace doesn’t follow them, serious injuries and accidents can result. Aside from the training and certification courses available at CertifyMe.net, our blog archive contains useful information to help you and your co-workers properly handle cargo containers. In this post, we cover some crucial safety concepts, including storage, security, hazard analysis, training, and much more. If you’re involved with daily, weekly, or monthly cargo container handling, read this blog today! Some of the effects of forklift accidents are obvious. But other negative impacts are felt long after the accident itself. This post provides a thorough outline of all the hidden costs of forklift accidents. From fines and legal action (including hefty 5-figure and 6-figure OSHA penalties) to costly equipment damage, forklift accidents directly affect any business’s ability to meet customer demand. Plus, any workplace violation or accident involving forklifts will likely trigger a lengthy OSHA investigation. This informative blog also explains how worker’s compensation legislation can create additional financial headaches, not to mention the negative publicity that comes with forklift accidents. With well-rounded, affordable OSHA safety training from CertifyMe.net, you’ll have a solid foundation of skills and knowledge to avoid forklift accidents.